Snow Tigers? People search for this. But there is no such creature. Or put it this way, there are no tigers with that formal name. Maybe people are searching for the snow leopard, a wonderful looking cat and a true rock climber. It is the only wild cat with the word “snow” in it. 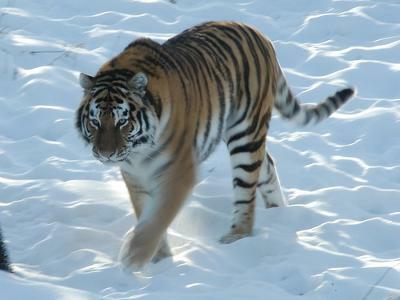 Or perhaps tigers that live in snowy habitats, in which case it would be the Siberian tiger. Or perhaps it is the white tigers that people are interested in. Those are the options but none of them are actually snow tigers. The snow leopard is awesome too. The most important things about these wild cats is their conservation because the big cats are very vulnerable to exploitation by people. What about white tigers? These are orange tigers with their coat colour diluted by the effect of a mutant gene. The gene is recessive so they are rare. There are probably none in the wild but lots in captivity because people breed them as they are very commercial “products”. People like white tigers but the breeding has to be forced by inbreeding and that carries real risks concerning health. A good number (I don’t know how many) of white tigers in captivity are born with health issues such as immune system problems and congenital defects through inbreeding. These problems are kept from the public.